We navigate the Internet by using names. Whether you are directly typing in a domain name (e.g. www.domains.asia) or if you browse by click, shoot or search, domain names are the underlying addressing system for Internet interactivity. At Namesphere, we believe in the future of the Internet of things where you can name everything online from your virtual self to your own fridge or TV in Internet names that speaks your identity. 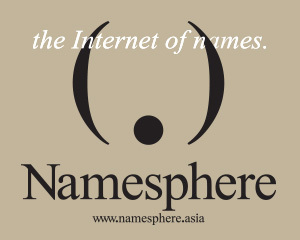 Namesphere is dedicated to the development of the Internet of names. Namesphere (www.namesphere.asia) is a brand of the DotAsia Organisation, the first generic Top-Level Domain (gTLD) from Asia. DotAsia is a not-for-profit organization with a mission to promote Internet development and adoption in Asia. Through Namesphere, DotAsia will invest its knowledge and resources to support new gTLD initiatives from Asia as well as those with a vision encompassing the Asia Internet community an marketplace. Leveraging the proven policy, technology, operations and market experience from DotAsia, Namesphere is your premier partner for developing your TLD. Whether it is the development of community relations, sunrise and launch policies, value proposition and market strategies; whether you are a community TLD, commercial TLD, geographic TLD or a brand TLD, Namesphere is prepared not only to provide creative ideas but the hands-on ability to successfully execute and implement with impact and compliance. Namesphere is not just a consultant; we are your full-service Front End Registry Solutions Provider. Drawing from the strong understanding of the diverse, young and dynamic Asian Internet marketplace from DotAsia as the first gTLD from Asia, you can leverage Namesphere’s knowledge in supporting strategic operations to reach the thriving market in Asia. The majority of the billions of users that are coming online do not speak English, IDN (Internationalized Domain Names) allows you to reach them. The Namesphere team are pioneers and experts of IDN technologies and markets. Awareness and community building are important cornerstones for TLD development. As a partner of Namesphere you can leverage the proven track record at DotAsia of successful community development programs that strategically builds awareness as well as contribute to serving the community. Namesphere is prepared to support TLD initiatives, as well as to work together with applicants to raise further funds. The Namesphere team has strong technological knowhow in EPP (Extensible Provisioning Protocol), DNS, WHOIS and other core components of the registry system. As a partner of Namesphere you can reach and draw from a wealth of industry experience and relationships, including the network of registries, registrars, resellers and registrants especially from Asia. At Namesphere we understand how best to position your TLD with the right segments in the industry. Namesphere will draw from the extensive knowledge at DotAsia who pioneered and implemented one of the most successful TLD Sunrises, along with startup processes, such as the Pioneer Domains Program (Founders’ / RFP Program), and the auction model which have become industry benchmarks. The success of a TLD Registry is built on sound policy development and implementation. As stewards of a global public scarce resource, TLD Registries must put in place effective policies to mitigate abuse and risks. At the same time these policies must support economic viability and expansion. Namesphere will work with each individual TLD Registry to tailor a set o Registry policies that works best for the business, community and public considerations. The value of a TLD Registry is directly derived from the contract and relationship. While you build your dream on your TLD, Namesphere will work to ensure that your business, market and operational initiatives and approaches can meet with ICANN compliance. Where appropriate, Namesphere will also advice and help instigate policy processes at ICANN to support your vision. The ability to reach the end customer is most important for a TLD registry. Namesphere will work with your team to segment and target your efforts through to the right customers. That includes identifying and establishing working relationships with the right registrars and resellers in the marketplace at different times through the development of the TLD: launch, expansion, growth, etc. Depending on your vision for your TLD registry, Namesphere will work with your team to identify the best approaches, including communications, public relations, mass media or otherwise, e.g. celebrity spokespersons, communication materials, roadshows, press conferences, speaking engagements at appropriate conferences, etc., to bring your message to the industry as well as to the mass market. The Internet is about open culture. A successful TLD must successfully engage the relevant communities on the Internet to feel associated with the TLD. Namesphere will provide our expertise and networks to engage with target communities through social media, community events and other serendipity approaches to plant the seeds for the community to identify with your TLD. You are interested to grow your business and market. Namesphere can talk technical with your technical backend provider to ensure that technologies are in place to support your vision and not to restrain you from the programs and ideas you have. The Namesphere team has significant knowledge and expertise in operating TLD registries, especially ways to make best use of the registry systems to support innovative market programs.